If you are thinking about adding renewables like solar or wind to your house or business it’s a big investment for both your finances and the environment. Contact San Isabel Electic’s Energy Services department for some real-world facts to help with that decision. Interested in learning more? Visit NRECA Solar Information or check out the Solar Calculator provided by Colorado State University. Most solar systems are connected to the electric grid. These systems are called “grid-tied”, meaning that electricity can flow to and from the grid. When your solar array generates more power than your home needs, the excess is sent out onto the San Isabel Electric Association grid, where it is used nearby. Likewise, when your solar array isn’t producing enough electricity to meet your needs, you’re able to consume electricity from the SIEA grid. This is called net metering. 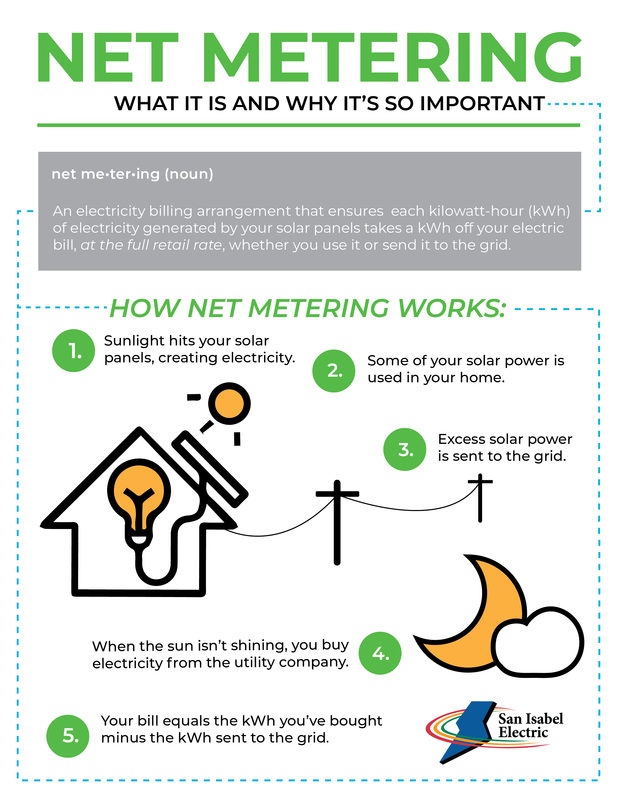 Net metering is the policy that makes compensation for your solar electricity production possible, allowing you to offset your electric bill with that production. In Colorado, net metering allows for a one-to- one credit for your solar electricity. SIEA has a full Net Metering program available to its Membership and highly encourages its Members to call SIEA first to make sure they are getting the facts about renewables before installation. The electricity you produce is equal in value to the electricity you receive from San Isabel Electric. So, if your solar array produces one kWh of electricity, you can directly reduce your electric bill by one kWh. If that kWh of solar electricity is generated when you don’t need it, it will be stored in your SIEA kWh bank and rolled over month to month. Your consumption will always be used out of your kWh bank first and is cashed out yearly in May at current SIEA avoided costs. 1. Renewables like Solar have to be considered a long term investment because it is a costly investment that has a usual 10-15 year R.O.I. (Return On Investment). 2. What your system produces will always be consumed by your house first and only excess generation will go back onto the SIEA grid and credited in your kWh bank. 3. Renewable energy is a rapidly evolving industry so as technology advances so likely will SIEA, so always be prepared and stay in touch with SIEA. 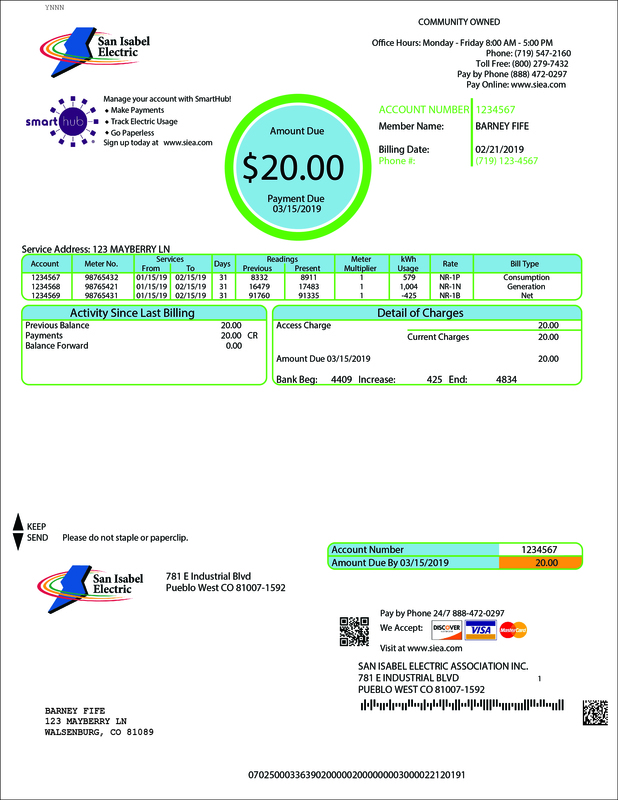 Prior to system installation, San Isabel Electric Association must approve it first, via a Net Meter Application. Your installer will submit the preliminary interconnection paperwork with San Isabel Electric Association on your behalf, making sure the size and location of the solar array is approved by SIEA. Once the array is installed, your local government will inspect it and SIEA will reach out to you and schedule a final Net Meter Agreement review and document signing. Interconnection after the documents are signed is nothing but a meter exchange. Once approved, SIEA will visit the installation and install a two-way meter (Net), which allows for more accurate reading and reporting of your solar electricity production. Once the Net meter is installed and SIEA gives you formal “permission to operate,” you can flip the switch on your solar array. 1. System capacity is limited to 10kw or 120% nameplate for residential. 2. System capacity is limited to 25kw or 120% nameplate for commercial. 3. SIEA does not require a REC meter. 4. SIEA currently offers no rebates or financial incentives for renewables. 5. SIEA follows current electric code for safety standards and installation. 6. SIEA’s yearly “true-up” for excess generation is done in May and is at current avoided costs (can range from year to year) 2017 was @7.51 cents. 7. SIEA requires NEM application before any work is done along with a $200 application fee. 8. After inspection by local authorities SIEA will reach out to the member for final document signing (NEM), usually done at closest area office for the member. 9. SIEA will likely follow up with member if system appears to be sized improperly or with any other concerns. 10. SIEA’s applicable access charge can not be offset with excess production and is currently at $20 per month for residential.